Last year about this time when my husband and I were preparing for our trip to Europe, I busied myself with finding recipes that might be typical of the region we would be in so I could try them at home. 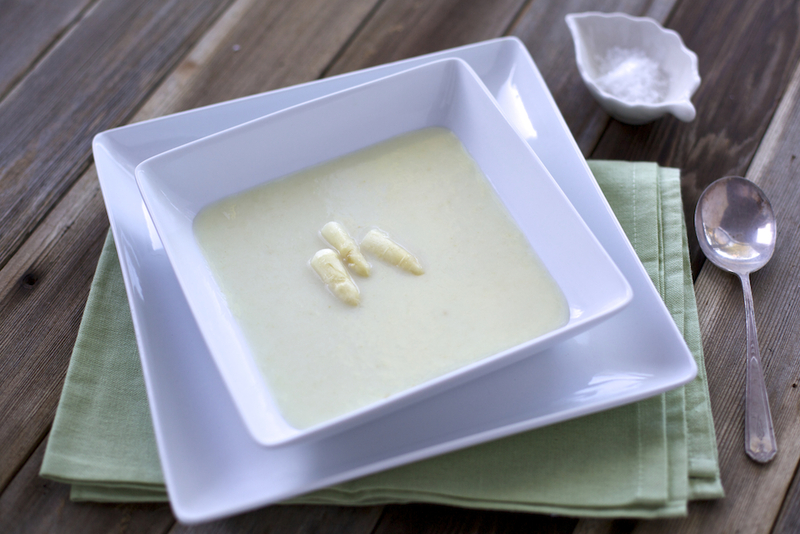 I was able to share a few of these before we left, but neglected to share the Cream of White Asparagus Soup I made. 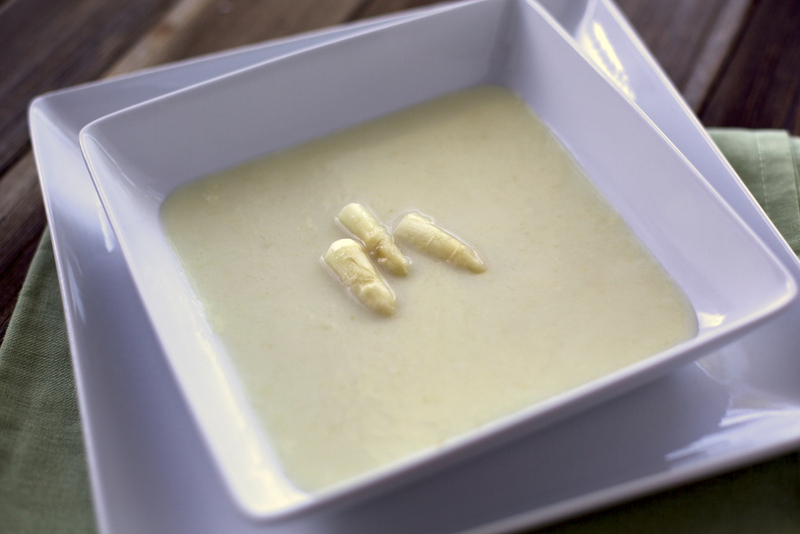 I’ve shared two asparagus soup recipes before — this one and this one, but both were prepared with green asparagus as might be expected. I’m no different than most Americans, evidently, when confronted with the white asparagus the French and Germans prefer. I see it on the rack at the market, almost an afterthought next to a large spread of green asparagus. In comparison it is easy to overlook even for someone like myself who seems always to choose the produce the clerk has to look up or ask the name of because no one purchases it. It’s anemic, and somewhat reminiscent of a phallic symbol, thin, and long, uncircumcised. Something El Greco might have painted in a still life minus the typical brooding darkness of most of his work. It rarely appears “plum and shiny” as I’ve read it described, so it’s easy to pass it by and choose the purple asparagus that has been showing up recently even though I’m aware that as beautiful as the purple variety is, when cooked, the vibrant color dissipates. Last April, everything changed. I read this article in the New York Times by Elaine Sciolino, and learned about how it’s cultivated, harvested, and the best way to prepare it as opposed to the green variety. 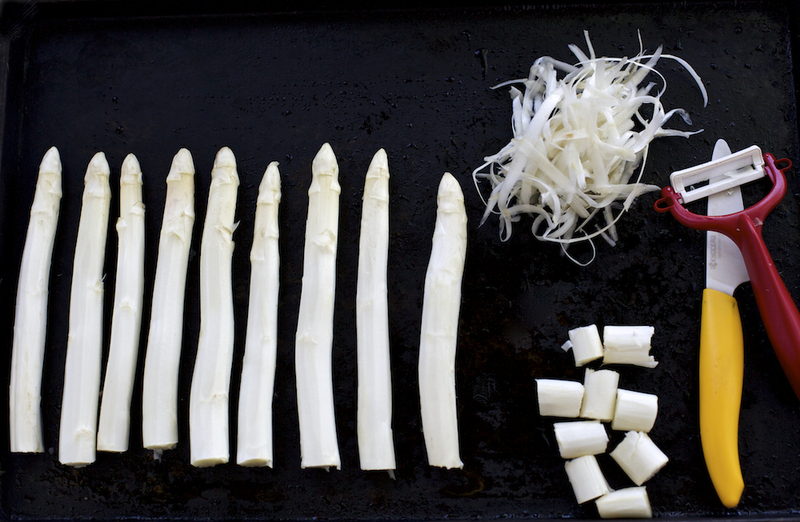 It piqued my curiosity and so I did some research for recipes before we left, finding that we’d most likely have a good chance of ordering something made with fresh white asparagus while both in France and Germany. Although we did see an abundance of asparagus menu items at the bistros we ate at in Paris, all seemed to feature green asparagus. 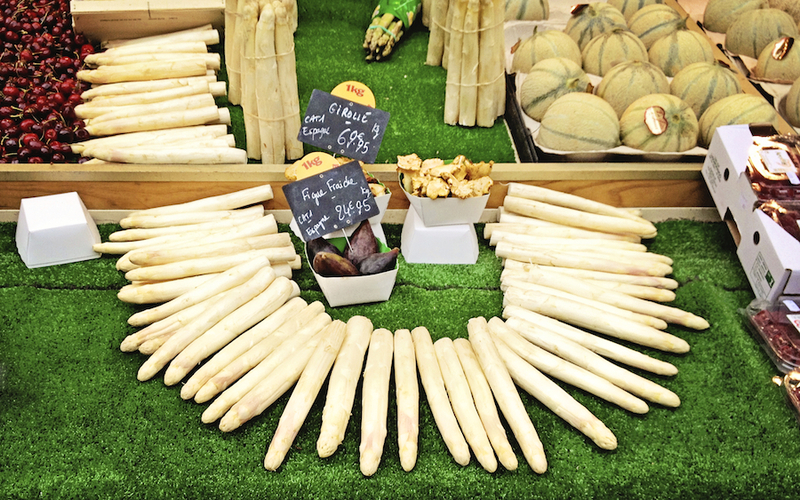 It wasn’t until we were walking along Rue Cler early one afternoon that we saw white asparagus. Honestly, it looked no different than what I was used to seeing in my market, but I remembered that the winter had been cold and wet, and white asparagus slow in coming to market last year. When we arrived in southern Germany, it was a completely different matter. 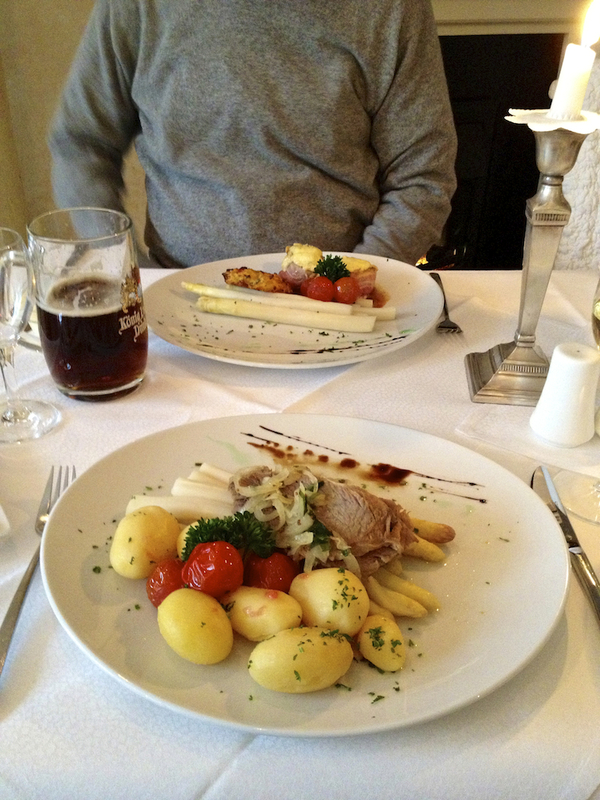 We saw white asparagus in many markets, and at Parsifal, the restaurant at Hotel Sonne Füssen where we stayed, it was featured in a multi-course dinner as part of Spargelzeit, or annual white asparagus celebration. We decided to make that experience the gauge for what I’d prepare once home. I decided to make the soup wanting to try and replicate its velvet consistency. After sifting through many recipes — although surprised at how few there were in comparison to recipes that use green asparagus — I chose this recipe because I thought it was the most basic, contained some cream but not a cup of heavy cream like many recipes I found, and was easy to prepare. The result? Flavor much more subtle than the green asparagus soup I’m used to. But unless I have a bowl of each in front of me so I can compare them, I honestly don’t know how different one could be from the other. It tastes like asparagus. 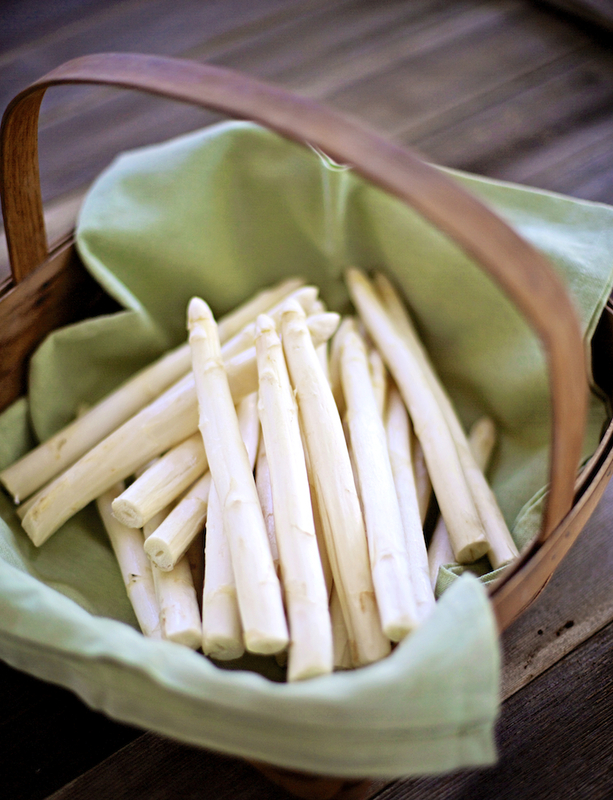 Some reviewers have said the white asparagus is less bitter than the green, and others say the opposite. 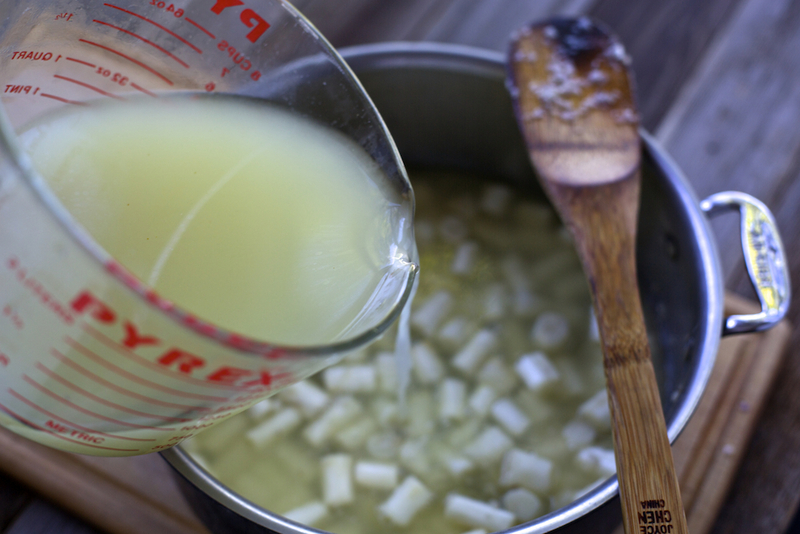 To each his own, I suppose, but will say I’m glad I’ve finally tried white asparagus soup myself and will now experiment with many of the other recipes I’ve found along the way. I used an immersion blender which is much easier to deal with than my large blender, but it rarely achieves the same results. 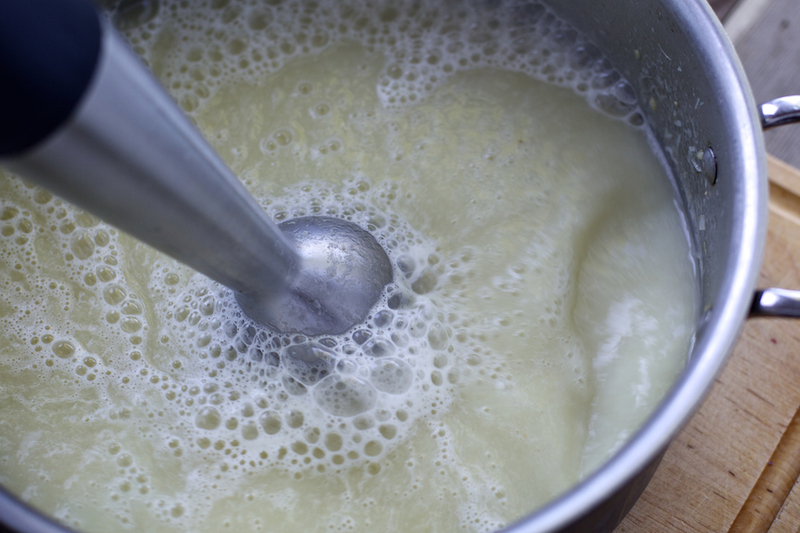 If you have the time and don’t mind making the fuss, then use an immersion blender, but pour the soup through a fine-meshed strainer (you’ll have to use a wooden spoon to stir the contents through) and then pour it into the blender for a final spin. You may think this is over the top, but I’ve learned that this technique results in the most velvety consistency and is completely worth the time. 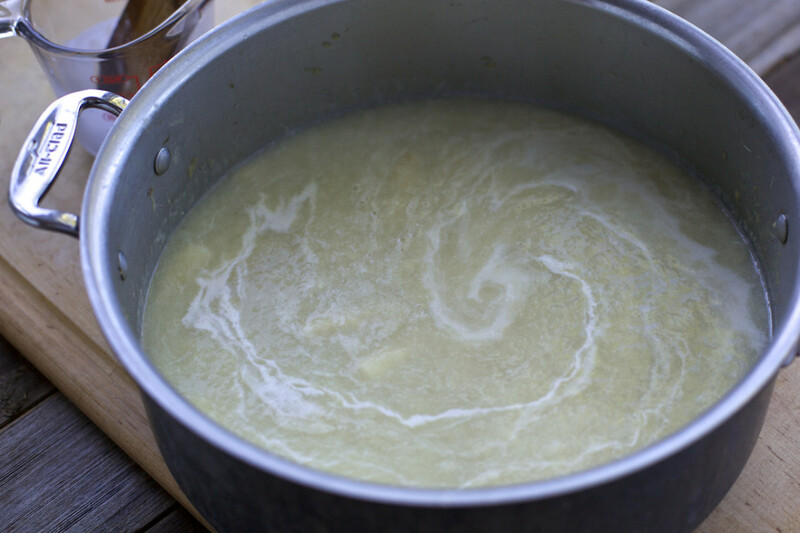 I may try using a potato instead of the half-and-half next time because I’ve had good results with that in other “creamy” soup recipes. It’s a nice option if you want a vegetarian or vegan soup. 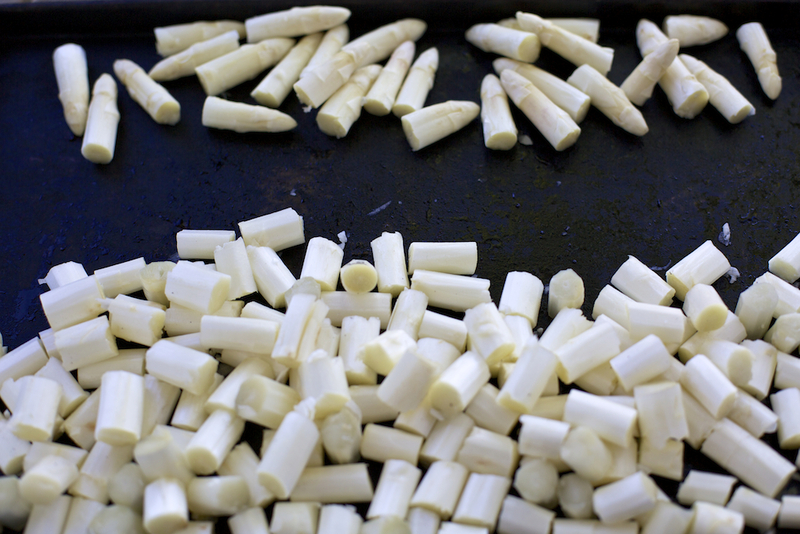 On the cost of white asparagus: Yes, it’s usually a dollar or two more per pound of vegetable. But think about it. I made this soup for the two of us and it fed us for two meals. Add a salad or some nice crusty bread and it’s a far more inexpensive and delicious meal than what you’d pay for something containing meat. To me, it’s not the cost per pound, but what I’m getting for my money — and this is well worth it.